Team self-steering is accomplished through a structured meeting that is used with regularity and several times or many times during an iteration. This type of meeting is used in order for the team to have a structured method of sharing critical information. Team self-steering is often done with a meeting called the “daily scrum”. 1.What work have you completed since the last meeting? 2.What work do you commit to complete before the next meeting? 3.What barriers are you encountering that are hindering your work or the team? Generally, the answers to these questions should be kept brief and concrete. For example, in reporting work completed, the report should name tasks that are completed. Some teams who are using an information radiator for their task tracking will physically manipulate the tasks in some way to indicate they are complete. Team members must avoid getting into details during this meeting. It is not a working meeting where any decisions are made or work performed. Even discussion among team members should be deferred to after the team self-steering meeting is complete. A future entry will detail some of the types of barriers that teams typically come across. One member of the team is specially empowered to track and eliminate the barriers. In the Scrum methodology, this person is called the Scrum Master. This person must have a pro-active and independent personality and have access to the rest of the stakeholders. The person eliminating barriers should remain the same over the course of an endeavor if possible. Every barrier mentioned in a team self-steering meeting should be resolved before the next meeting if possible. If that is impossible, the unresolved barriers are reported to the team and the team decides for itself how to work around the barrier. As a rule of thumb, this meeting occurs every day at the same time of day. With a team of about eight people, the meeting should take less than fifteen minutes. Stakeholders who are not committing to perform work may observe the team self-steering meeting, but may not otherwise participate. Some teams may be in a situation where they have people filling roles as managers, project managers, team leads or administrative assistants. All these roles can be integrated into a self-steering team. The key to doing this is that all team members must be willing to move beyond the strict definition of their role, and participate with equal responsibility for delivering results. For some people, moving outside of a defined role is very uncomfortable, or undesireable. These people may become effective team members with careful coaching. In general, teams that are very new to self-steering benefit from external coaching that provides insight into teamwork, organizational culture, and personal development. All three disciplines are necessary components of creating a high-performance self-steering team. The team self-steering meeting amplifies learning and feedback, enables responding to change, helps empower the team, emphasizes individuals and interactions as well as valuable results. 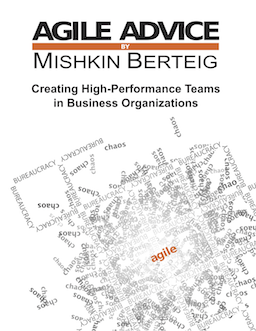 This practice is critical to agile work.